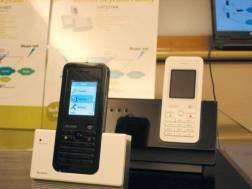 Taiwan-based Accton Technology unveiled its Skype-enabled Wi-Fi phone, the SkyFone WM1185-T, in Tokyo at the so-called “Skype day” event. The new unit [.jpg] enables a talk time of up to four hours with a stand-by-time of up to 20 hours and is likely to be initially priced at over US$150 in the retail market, according to sources. Accton also plans to introduce dual-mode mobile phones that support both GSM and Wi-Fi technology in early 2006. Accton plans to ship 5,000 of the new wireless phones to Skype’s business partners and wireless broadband service providers worldwide for testing in December, with volume shipments slated for the first quarter of next year, according to company sources. Accton is now developing ASICs (application specialized ICs) for the Skype phone, aiming to lower the phone’s overall production costs by 20% and bring the retail price to below US$100, said Ken Lu, Accton’s executive vice president. In addition to supporting Skype-embedded technology, Accton will also introduce dual mode mobile phones that support both GSM and Wi-Fi technology in early 2006. Via: DigiTimes.